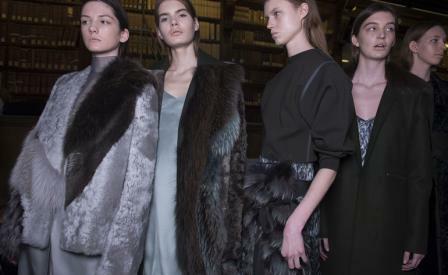 Mood board: As always, Gabriele Colangelo delivered a fur-centric fashion collection that was distilled through a rigorously puritan lens. Clean lines and a sober, smooth palette kept these clothes whispering softly but making a lasting impact. Best in show: The fur was, as always, a show stopper. Especially noteworthy this season, were the striped intarsias that created graphic lines in muted tones of navy and grey. Finishing touches: Colangelo cut a mean, minimal boot this season that had an edgy pointed toe, no-nonsense flat heel and clean leather ankle strap. It worked beautifully with everything.